Thermomix ® is sold exclusively by independent Thermomix ® Consultants. Book your Cooking Experience to experience the benefits and versatility of Thermomix ® and discover an easier way to cook. 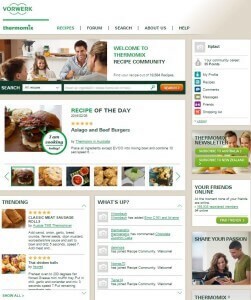 The Thermomix ® Recipe Community is the place to go if you’re hungry for more Thermomix ® recipes. You’ll find thousands of recipes from chefs, Advisor and other community users including tempting treats, hearty mains and tasty snacks. Become a Thermomix ® Advisor. Work independently in showcasing this brilliant appliance. Thermomix ® Experience Centre Hanoi: S10-P11 Parkhill Premium Vinhomes Times City, 458 Minh Khai Str., HBT Dist., Hanoi. Call us 024 3513 2299. Sign up to our newsletter to receive exclusive recipes from our Thermomix ® test kitchen, professional chefs and special guest contributors. You’ll also be the first to know about our latest cooking classes, cookbooks, customer promotions and more! Are you a Thermomix ® owner?